The Basics of Heart-Healthy Eating | Alexia Lewis R.D. There are no magic foods or techniques to heart-healthy eating. There are just four basic ideas to consider for planning and yummily living a heart-healthy lifestyle. (Yes, I know yummily is not really a word!). I recently was asked to be part of a panel for a talk about nutrition and health. My section of the panel discussion focused on heart health. I will be adding a few posts to share the information from that discussion on my Web site. The four tips are (1) increase fiber, (2) change up your fat intake, (3) decrease sodium/salt, and (4) maintain a healthy body weight. Eat whole fruits and vegetables with every meal. Choose whole grains such as brown rice, whole wheat pasta or bread, quinoa, or even air-popped popcorn! Packaging with grain products can be tricky to navigate since food manufacturers use colors (brown) and phrases that can dupe many people. The trick with choosing whole grains is to ignore the front of the package and flip the package over to read the ingredients listing. 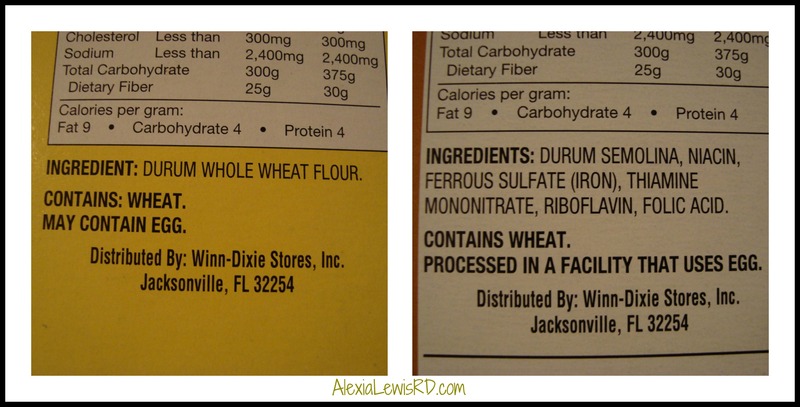 If the first ingredient is listed as “whole” grain (ex: whole wheat), then the product is mostly made of a whole grain. If the first ingredient is something else (ex: enriched wheat), then put that brand back on the shelf and check another one. Did you notice I didn’t say reduce your fat intake? That’s because there are different types of fats and some are heart-healthy. Fats are necessary in our diet and they give food flavor and texture. Skipping on fats is not healthy or yummy! Studies show that replacing saturated fats with unsaturated fats reduces the risk of heart disease. So skip on the saturated fats – one way to remember which fat to skip is to think “if the fat is saturated, it saturates your heart with fat!” Trans fats also increase the risk of heart disease and should be avoided as much as possible in a heart-healthy diet. 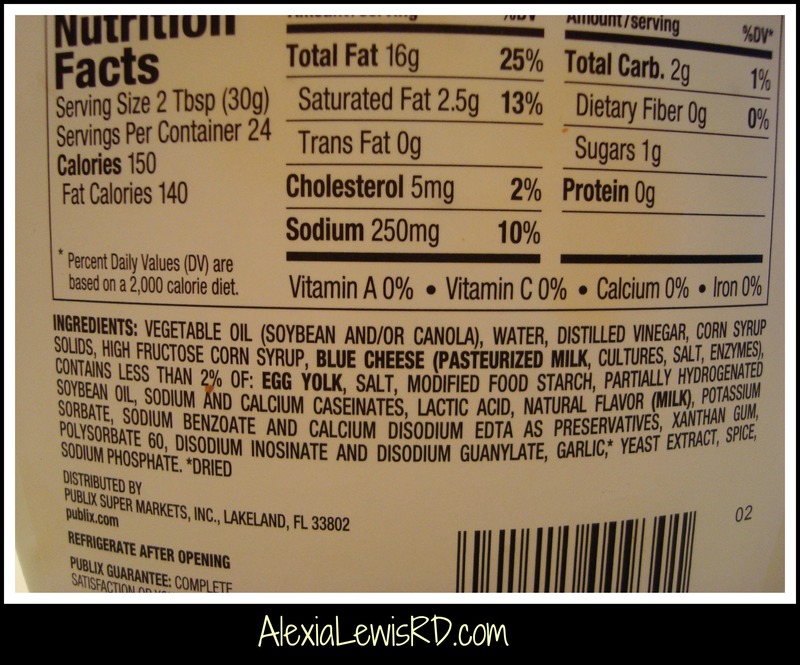 Can you find the trans fat in this salad dressing? First things first – if the salt shaker is on the table or next to the stove, put it away! Use other spices and flavorings to season your food. Also, reduce the number of canned and packaged foods you eat. Salt is a great preservative and flavor enhancer so it is used in high amounts in canned and packaged foods. Balance your energy/calories taken in from foods with your energy/calories burned up with exercise and movement. If you watch TV at night, stand up and dance around during commercials. If you work at a desk during the day, take mini breaks for quick walks or walking up/down stairwells. Use cooking methods that limit added calories. Try baking, boiling, roasting, or using counter-top appliances such as steamers or slow-cookers. Limit the added sugars in your foods. Added sugars are associated with a whole host of conditions and chronic diseases. Once again, flip that package over and scan the ingredients list for the many names of sugar (honey, molasses, dextrose, brown rice syrup, organic cane sugar, etc.). But remember – natural sugars in foods are not associated with these health outcomes so don’t avoid foods because the nutrition label says there are a certain number of grams of sugar in the product. If the sugar is natural (lactose in milk, fructose in fruit), then enjoy the food in a reasonable amount. If the sugar is added (on the ingreidents list), put it back on the shelf! 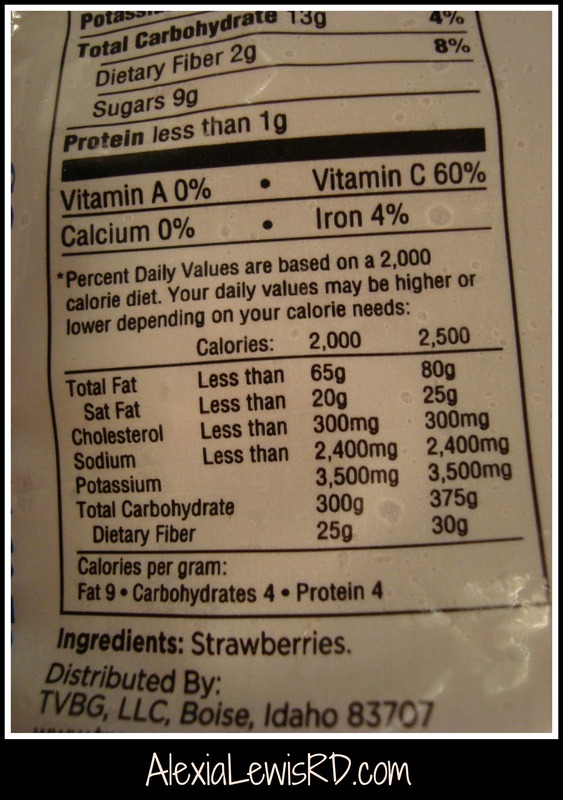 Compare the below label from frozen strawberries (9 g sugar but only ingredient is strawberries) to the above label from the salad dressing (1 g sugar but is mostly from added sugars listed as corn syrup solids and high fructose corn syrup). That’s a lot if you are thinking about making all these changes at one time. Don’t do that! I advise my clients to pick 1-2 things to change and work on those first. Once those changes become easier, pick another 1-2 things to work on. Take baby steps to your heart-healthy lifestyle. For example, if your first goal is to reduce saturated fats in your foods, start by educating yourself by researching recipes, reviewing restaurant menus, talking to others for ideas, or (of course) meeting with a registered dietitian. Then plan some baby steps. Week 1: change from whole milk to 1% milk. Week 2: try a butter blend with unsaturated fat. Week 3: change one meal a week from beef to fish. Before you know it – you’ll be living yummily heart-healthy! 1 small kiwi, peach, orange, or whole fruit of your choice – choose a sweet-flavored fruit! Mix all three ingredients together for a breakfast made up of protein, carbohydrates, and fats with a focus on heart-healthy fats and fiber with no added sodium or sugar.